Google accidentally released its Q3 2012 earnings report far ahead of schedule today and is blaming the financial printer RR Donnelley for this mix-up. When the release first appeared on the SEC’s website (including a number of editorial comments), it was not clear if Google accidentally filed the report early or if this was on purpose, but a mid-day earnings release like this is highly unusual. One thing that was clear, though, was that the stock market was not happy about this. 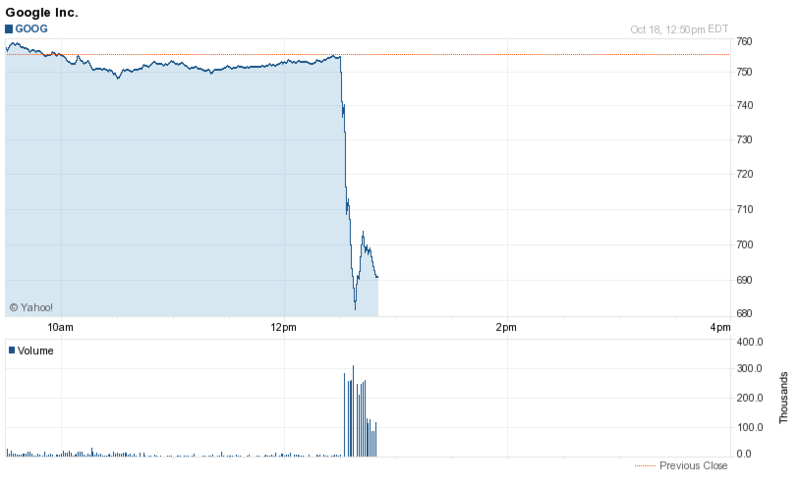 By the time trading was halted at 12:50pm EDT, Google’s stock was down about 9% and traded for well under $700. Earlier this morning RR Donnelley, the financial printer, informed us that they had filed our draft 8K earnings statement without authorization. We have ceased trading on NASDAQ while we work to finalize the document. Once it’s finalized we will release our earnings, resume trading on NASDAQ and hold our earnings call as normal at 1:30 PM PT. In its earnings, Google reported $14.10 billion in revenue and an EPS of $6.53, missing most analysts’ predictions.